When I was around 17 or 18 (and living in a household of very competitive women all with their own culinary streak) I decided to get a French ice cream maker, A Donvier – which was a manual ice cream maker with a cold core very similar to the KitchenAid. Because it was manual, I could look forward to 25 minutes of cranking the handle while day dreaming about living in the 1980’s… ah, yes… good times. Anyway – I digress. The recipe. 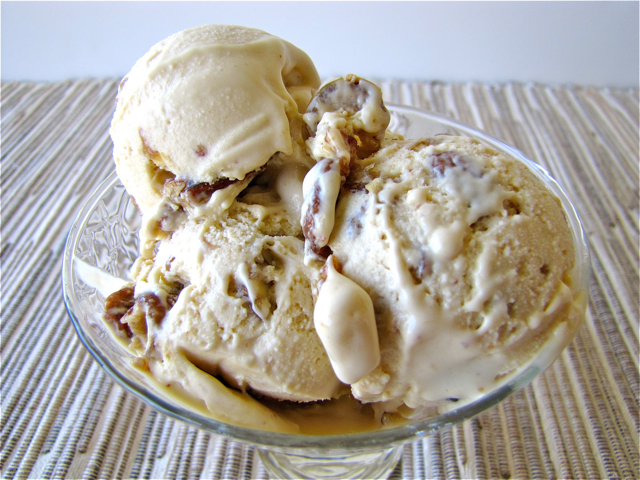 If there is a top 3 ice cream flavour or style, it may just be butterscotch because it is a subtle variation on vanilla with a twist of something sweet but not as refined as chocolate. Butterscotch: No idea where the name came from, but since it mentions Scotch… I thought, what the heck. Away we go. Important put aside a few tablespoons of the butter/salt/brown sugar for the roasted pecans – more on that later. Add the warm sugar/butter/salt/milk mixture to the eggs whisking constantly to avoid a scrambled egg mess in case the sugar/milk mix is too hot. Put this mixture back into the 2 quart saucepan, and keeping an instant read digital thermometer bring the “custard mix” up to a temperature of between 160 and 170 – but no higher! In yet another container (that will sit on an ice bath) put the remaining cream. Place a fine strainer on top of this container and then pour the “custard mix” through the strainer into the bowl (being ice chilled) that holds the remaining cream. Add the vanilla and scotch and stir to mix. This is your ice cream “pre-mix” – after it has cool and or stabilized, take it off of the ice bath and put it into the fridge for 2 hours to chill. Roast some nuts – While it is chilling, prepare your roast pecans. You can use almost any nut but preferably something with flavour and texture – walnuts are a good alternate choice – or pistachios. Melt the butter in a skillet or sauce pan on medium heat. Toss in the halved pecans or walnuts. Add a twist of kosher salt. Stir to coat the nuts and then spread them across a cookie sheet on top of a layer of parchment. The parchment paper protects the nuts from burning and sticking. Put in a 350 degree oven for 9 minutes, turning once at around 5 minutes. so of the sugar mixture you kept from earlier. You can even darken the sugar mixture by heating it in advance and reducing it a bit. Coat the nuts. Let cool. Chop the nuts into small pieces. Put aside. Add your ice cream pre mix to your ice cream maker and follow the manufacturer instructions. And when your churning cycle is around 1 minute remaining, add the chopped nuts. Empty your ice cream into the storage container of your choice and freeze for 2 to 4 hours. Note any ice cream that contains alcohol will not set as quickly or as firmly as ice creams without alcohol. The more hard liquor you add, the more difficult your ice cream will be to set. Notes I found with 1 tablespoon of Whiskey that it was hardly noticeable in terms of flavour – Rum would have been a better choice. It’s up to you. I used a very dark raw brown sugar which created a pretty dark ice cream – a tad non traditional – that said, it has a deeper flavour. Personal taste. And up to you as well what you use. I have done Rum Raisin..soaking the raisins in a cup of dark rum which help contains the the rum from the ice cream.. the recipe was from Saveur.I use the Cuisinart 2qt maker and have 2 bowls for it but am seriously considering buying one with a built in chiller.